Our correspondent Chad Grochowina is attending the Taipei International Bicycle Show, and made reference to a proliferation of new hub and axle dimensions that are being displayed [See Daily News - Taipei Bike Show: Day 1]. Shortly after we received his report, SRAM announced the new Boost specification for hubs, cranks and forks, as well as the corresponding products from their SRAM and RockShox brands. 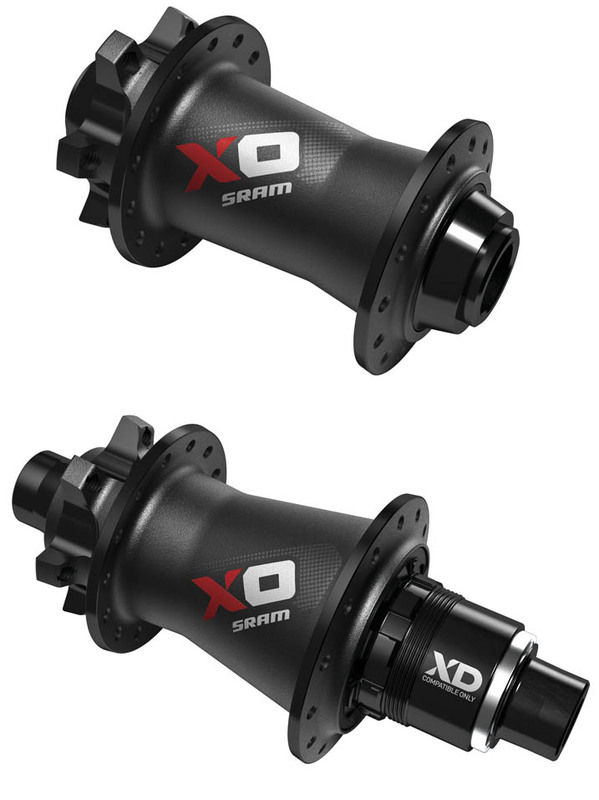 Basically, this new standard is 148mm wide for the rear hub and 110mm wide for the front hub - an increase of 6mm and 10 mm, respectively. The difference is all between the hub flanges, which creates a wider stance for the line the spokes take to the rim. In turn, this requires a longer axle for the crank to maintain chain line, and a wider fork to accept the new wider front wheel. There is actually a very good reason for the change: the larger diameter 29" and 27.5" (650b) wheelsets that are taking over the market for mountain bikes. 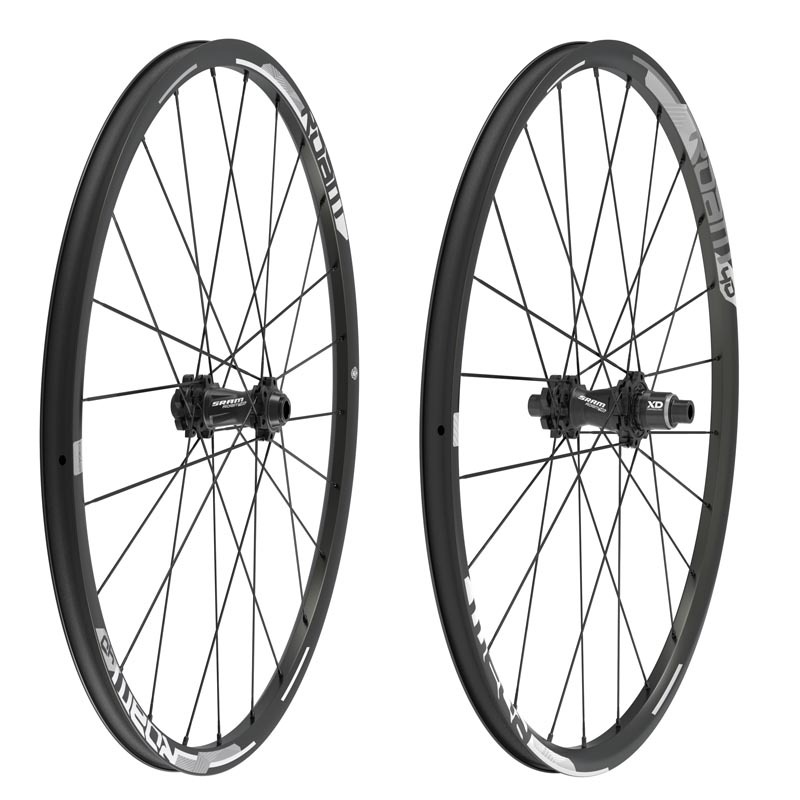 These wheelsets use longer spokes and, with current 100mm / 142 mm hubs, don't have as much lateral support as older 26" wheels. Although, it must be pointed out, the difference in strength likely wouldn't be a concern for most casual riders. SRAM is calling this an open platform specification, so they are hoping other manufacturers of components will also adopt, and that bike manufacturers will spec it. Trek was the first to do so with the Remedy 29 - at least for the 148mm rear hub spacing. The Boost system crankset utilizes front chainrings that sit a corresponding 3mm outward to ensure the required chainline, but Q-factor is completely unaffected. A major benefit to the repositioned chainring is increased clearance, which allows more options for tire choice and rear-end designs. Note: Boost cranks can only be used when paired with a 148mm hub. 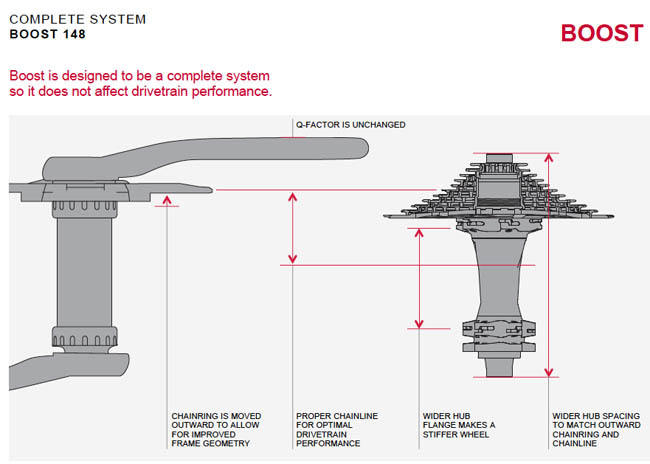 The Boost system uses a front hub that is 10mm wider than a 100mm design - each flange is 5mm farther from center. The greater flange offset allows a stronger spoke-bracing angle resulting in a stiffer wheel. Given the same rim and spoke spec, a 29" wheel built with a 15x110 Boost hub becomes as stiff as a 26" wheel built with a standard 15x100 hub. Boost technology is available in Roam 40 wheels (for both 27.5" and 29" ) as well as X0 and MTH 700 Series hubs. • BOOST 12x148 and 15x110 options available for 27.5" and 29"
The Boost X0 hubs have a tapered aluminum axle, accept all axle types and 32 hole. They come in a sand-blasted black or glossy black and accept 11 speed XD cassette body, or 8, 9 or 10 speed bodies. Weight is 130g (front) and 250g (rear). The 700 Series hubs have the same internal mechanism as X9, with 32 spoke holes and accept 11 speed XD cassette body, or 8, 9 or 10 speed bodies. Weight is 170g (front) and 410g (rear). 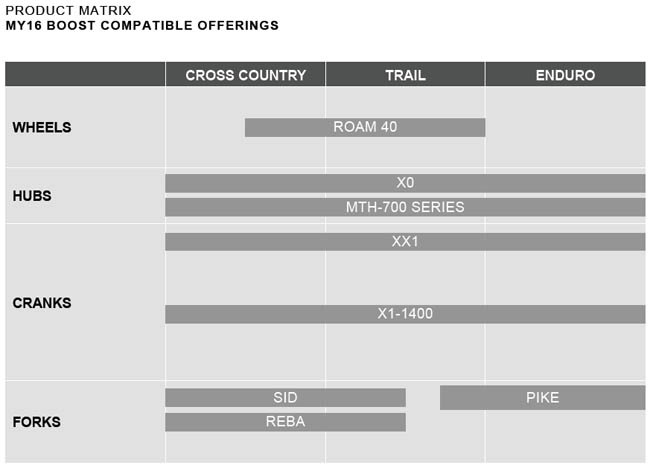 RockShox will offer Boost compatible models for the MY16 SID, Reba and Pike lines. 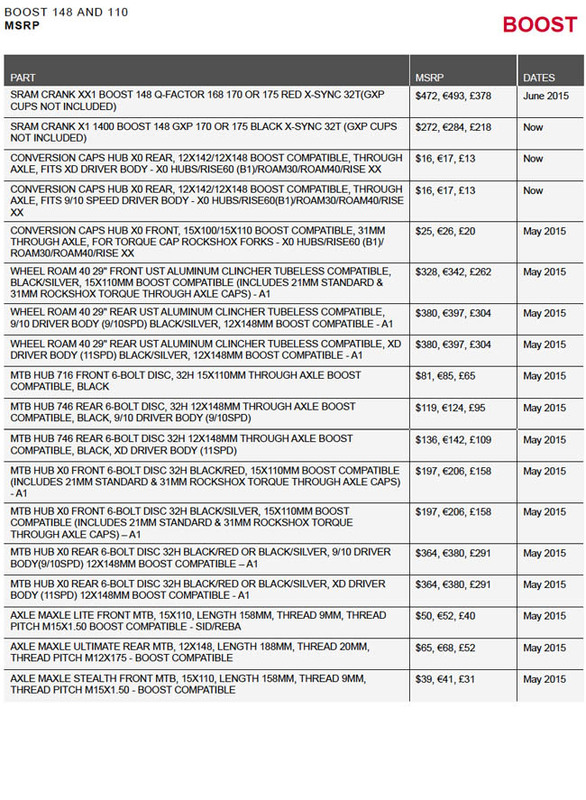 All 29" forks with Boost compatibility will also fit 27.5" Plus wheels (27.5" x 3.0 tires).